PATEK PHILIPPE REF. 5075 BIRDS OF PARADISE ENAMEL DIAL MADE IN 15 SETS OF 4 PIECES WHITE GOLD Patek Philippe, Genève, Movement Nos. 3238510, 3238518, 3238547, 3238546, Ref. 5075. Sold in November 2002. Very fine and rare set of four 18K white gold, self-winding, water-resistant Calatrava wristwatches with cloisonné enamel dials. Accompanied by a Patek Philippe large wooden fitted box, certificates of origin, limited series attestation. Two-body, solid, polished and brushed, transparent and screwed-down case back, wide bezel, straight lugs. Cloisonné polychrome enamel, outer white gold rim with applied circular five minute indexes. White gold dauphine hands. Cal. 240/119, stamped with the Seal of Geneva quality mark, rhodium- plated, fausses côtes decoration, 37 jewels, straightline lever escapement, Gyromax balance, shock-absorber, self-compensating flat balance-spring, engraved goldmicro-rotor with flower motifs. C. Two-body, solid, polished and brushed, transparent and screwed-down case back, wide bezel, straight lugs. D. Cloisonné polychrome enamel, outer white gold rim with applied circular five minute indexes. White gold dauphine hands. M. Cal. 240/119, stamped with the Seal of Geneva quality mark, rhodium- plated, fausses côtes decoration, 37 jewels, straightline lever escapement, Gyromax balance, shock-absorber, self-compensating flat balance-spring, engraved goldmicro-rotor with flower motifs. Dials and movements signed. Made in 2001, this set features cloisonne enamel dials available only to PATEK PHILIPPE's best customers. 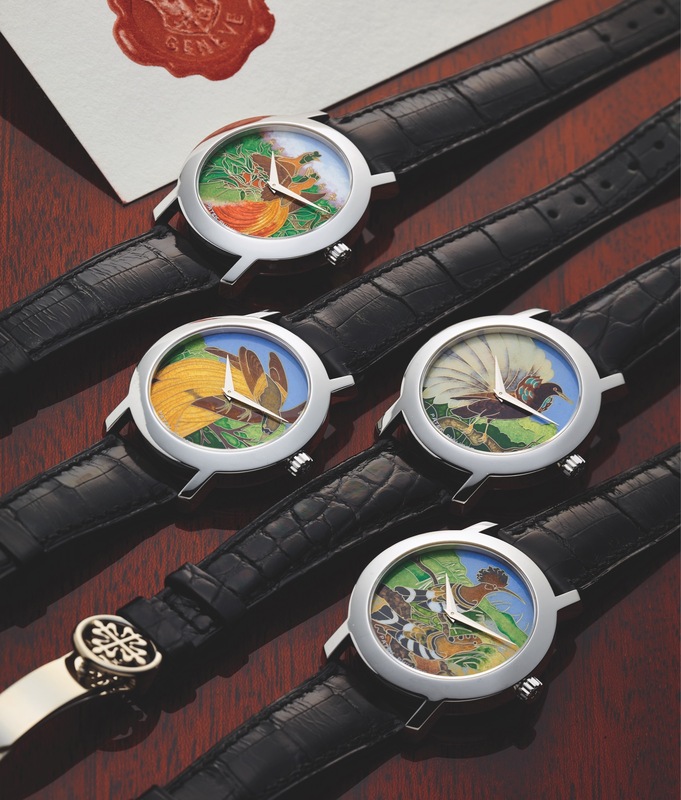 Made in a limited edition of 15 sets (each comprising of 4 pieces), they each featured a different dial in this case, BIRDS OF PARADISE, and are particularly beautiful with their vivid colors similar to true life.